It’s amazing to think back to when I was first introduced to email in the early 90’s. I couldn’t imagine why on earth I would write a message rather than pick up the phone and simply talk to the person. The company I worked for at the time was encouraging the use of email, and most of us were resisting the new technology. A few years later, I was working for a small, liberal arts college and was enrolled in a master’s program. By this time, email was more popular and I “got” the technology. Thought it was pretty cool, actually. In one of my first classes, the professor was going to try something new and edgy with our class: we would email our weekly journal entries to him. (oooooh!) Believe it or not, this really was considered to be avant-garde at the time. And the class had an amazing amount of difficulty, with attachments getting lost and firewalls getting in the way. At this point, I’m much more likely to send an email than call. I’m not sure if that’s a good thing or a bad thing, but email has allowed me to keep in touch with people much more easily. I love being able to dash off a quick note to a friend and say hi – and get an answer back in a few minutes. At MPOW, we’ve gotten into Instant Messaging as well. Most of us are using Trillian, which is an IM aggregator. I probably talk to Aurora more on IM than I do in person…..after all, she’s all the way on the other side of the building. (For those of you who have never been in our building, that comment is rather self-deprecating – the building is not that big. I just can’t be bothered to get up and walk over there.) If you’d like to talk to me, my Yahoo ID is mbsam. I must admit, text messaging is not my thing. My DSD, on the other hand, would rather text than actually talk to you – or send email, for that matter. I can see a use for text messaging in a library setting as another communication tool, especially if the library is interested in reaching a younger demographic. So the big question is: if many, if not most, of our patrons are using these communication tools, why don’t we allow them to use these same tools to communicate with us? For the uninitiated, Flickr is a photo hosting tool, which allows people to view your photos online. This is particularly great for people who live far away from where you are but want to see your photos. My new sister-in-law’s family in the Ukraine was able to see wedding photos by viewing my Flickr account. Amazing. It’s easy to share Flickr photos via a blog. Just for fun, here’s a photo of my parents’ goldendoodle puppy, Sherlock, curling up with our goldendoodle, Casey after a long day of exhausting play. How cute are they? Sherlock is 7 months old to Casey’s 3 years. Casey’s tormented by Sherlock almost ceaselessly, which is payback for him having done the same to his “sisters” a few years ago. 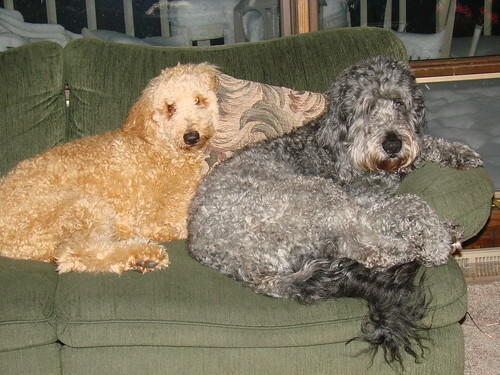 A goldendoodle, by the way, is a mix of a golden retriever and a standard poodle. They’re big and fluffy and bouncy and sweet. Kind of like having a Tigger in the house. So how about those Flickr tools? Lots of cool stuff you can do with them, but one of the coolest ideas is to use the Trading Card for your library’s business cards. The Carleton College library does this, and they’re fun and informative. 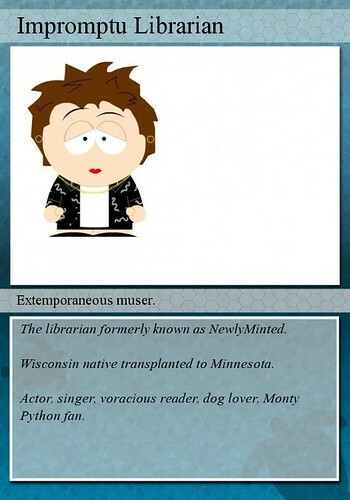 That’s my South Park character on the card. And finally, there are the image generators. These things are fun. There’s a terrific blog that’s all about image generators, so you can keep up with the latest. (Yes, this is one of the blogs in my aggregator.) 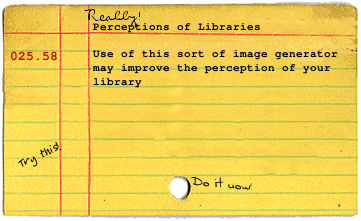 Can’t you see a use for this in your library? I came late to the RSS party, but finally decided to check it out after hearing Michael Stephens talk about it on his Tame the North Tour. I’m now a Bloglines addict. I have 165 blogs in my feed, and that number could grow at any moment. I really am trying to restrain myself. But there are so many interesting blogs out there, and so many people writing about such interesting stuff…. The Wednesday Chef – a mix of recipes from newspaper food columns. The Shoebox Blog -a blog by the folks that bring you those funny Shoebox Hallmark cards. The Daily Coyote – a blog written by a woman living in Wyoming who adopted a 10-day old coyote puppy whose parents had been killed. Incredible photos. Lifehacker – tips and tricks for getting things done. If you read one non-library blog, this should be it. Cute Overload – because sometimes, you just need a moment of cute. That’s just a sampling, of course. Go ahead, take the plunge and find your own fabulous blogs to aggregate. Check out Bloglines or Google Reader and add sites you find interesting. If you tire of them after a while, you can always remove them from your list. Believe me, you’ll wonder how you ever kept up with blogs without it. I have the honor of being in the WebJunction Member Spotlight this month. Tim was kind enough to blog about the spotlight in BlogJunction, too. I’ve worked with WebJunction on a number of projects, and they are terrific people, one and all. Thanks for the spotlight! We’re in the midst of the state-wide 23 Things program here in Minnesota, and thing 2 is to ruminate on the concept of Library 2.0. My thoughts, though, fall somewhere between the hopeful posts listed on the page for Thing 2 and the newer Library 2.0 post on Blyberg’s blog. I do have one basic problem with Blyberg’s blog post that is required reading on the 23 Things page: the assumption that libraries aren’t relevant. Circulation has, for the most part, steadily increased since 1990. How is that proving our irrelevance? But somehow, all the library literature out there acts like libraries are some decaying being. That bothers me. We fail as librarians in buying into the hype that libraries are dying on the vine, without actually looking at the situation very critically. I think that is one of the main failings of Library 2.0– it’s all about poking holes into institutions that may, yes, sometimes need a finger in their direction– but it seems to be poking those holes at random with no real evaluation going on. Good point, and one that hadn’t consciously occurred to me, but was instead lingering in the back of my mind. Libraries are relevant and are important – and aren’t failing as institutions. It’s not that what we’re doing is wrong, but much of the Library 2.0 literature insinuates that we are. You’re old, you’re antiquated, you’re outdated, and you’re losing your clientele. Hmpf. No wonder so many librarians are a bit put off by the whole thing. Look, libraries are still doing what we’re best at doing – finding stuff and organizing it so people can find it. We’re the keepers of the information, and we’ll gently take you by the hand and help you find it. It’s what we’ve been doing for a very, very long time, and it’s what we’ll continue to do. So chin up, Dear Librarian. You’re doing wonderful things. So, what about this Library 2.0 stuff? Well, they’re swell new tools that can help you do your job better, that’s all. For all of the hype and occasional hysteria, all of these things are tools. Nothing more, nothing less. Some of the tools will fit better for some libraries than others. Some of the tools may not fit your situation at all. But not every tool works for every job – that’s why we have tool boxes with many, many tools. Don’t use a hammer when a wrench will work better. Don’t be afraid to give some of this stuff a try. You just may find a new tool for your library tool box.